ao・onigiri is an Onigiri specialist, where you can indulge in fresh, hand-made onigiri rice balls. Onigiri refers to the triangular or sometimes round balls of rice which have been a cherished staple of Japanese lunch boxes, and even just as snacks on the go, for millennia. Here at ao・onigiri, you get to sit down at the counter and see the owner cook up onigiri rice balls right in front of you, just like at a traditional sushi restaurant. From making sure the kitchen is stocked, to prepping the ingredients and whipping up the onigiri, the experienced head chef and owner, Aomatsu, runs the entire place by himself. That’s probably why when it gets busy, Aomatsu doesn’t waste time on formalities and can come off a bit direct. So depending on your timing, you might walk in and feel a bit of tension in the air. However, no matter how Aomatsu comes across, there’s one thing you can be sure of, that he’ll be in there every day, cooking up Japanese soul food, with the sole purpose of bringing a little bit of sunshine to your day. And that feeling definitely comes across in every single one of the delicious onigiri he makes too. So when you come to ao・onigiri, don’t judge a book by its cover, go in with an open mind and save any judgments for after you’ve tried a mouthful of the absolutely mouthwatering rice balls. 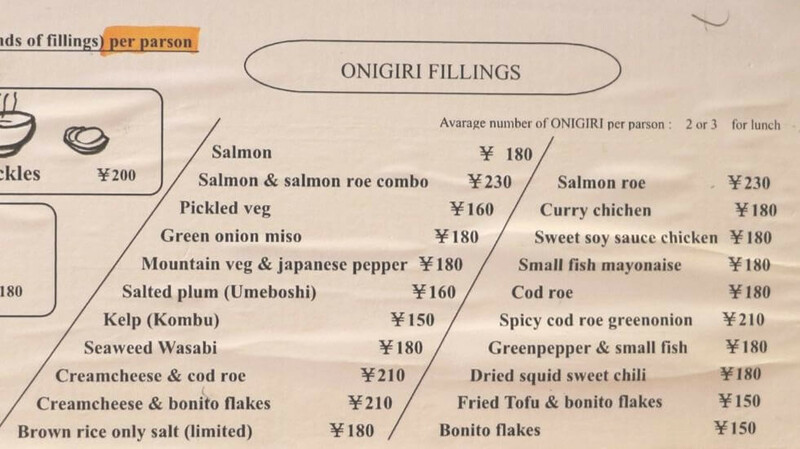 ao・onigiri does have a fantastic English menu as well, but they are certainly not trying to pander to Kyoto’s tourist crowd. ao・onigiri cherishes locals and work to be a spot loved and frequented by those locals. That’s why we think ao・onigiri is the perfect place for anyone wanting to get off the beaten path of sightseeing spots in Kyoto and enjoy somewhere that’s, at its heart, by locals, for locals. The perfectly salty salmon is a classic onigiri filling that all Japanese people would have had at least once in their life. This onigiri may be simple, with just rice, salmon and seaweed, but it is precisely that simplicity that allows the quality of the ingredients and the care that went into making it stand out. When you take one bite of this salmon onigiri, the fluffy rice—cooked to perfection in an old fashioned hagama rice cooker—will fall apart in your mouth as it blends and mixes with the salmon. If you’re unsure about what to order, we recommend sticking with a classic, and going for this salmon onigiri. This onigiri has a sweet soy sauce chicken filling, made from stir fried marinated minced chicken. Usually, this kind of minced chicken is crumbly and goes all over the place, but ao・onigiri’s chicken holds together well and goes perfectly with the rice. The sauce is both salty and sweet, so you’ll down the whole onigiri before you know it. Just like the salmon onigiri, the ingredients here are simple, but they’re prepared in a way that gives them a surprisingly exciting soul food goodness. This out-there onigiri is stuffed with cream cheese and cod roe, a fantastically unique paring even in Japan, so we were sitting on the edges of our seats with excitement to try our first bite. When you take your first bite, you’ll be hit with the exquisite pairing of rice, cream cheese, and salty cod roe, a flavor so delicious it’s bound to have you hooked. From the mushy cream cheese to the starkly different popping cod roe, which explodes in your mouth, the entire texture of this onigiri is just incredible We recommend this cream cheese and cod roe onigiri to anyone who is looking to try something you can’t find anywhere else. A special seaweed and wasabi onigiri. As you can see in the picture above, the onigiri is topped with roughly grated wasabi, which unlike wasabi paste, means that it maintains its original texture. One bite of this onigiri and the wasabi will hit you with an awesomely refreshing punch. The wasabi is also actually more refreshing than it is spicy. Also, when paired with the fragrant seaweed, the wasabi’s spice is even further tempered. This onirigi manages to strike an incredible balance between two of Japan’s most famous ingredients, seaweed, and wasabi, so we definitely recommend it to anyone wanting to try something very classically Japanese. 1. Regardless of whether you’re eating in or not, please use the pens and paper provided on the counter to place your order. 2. 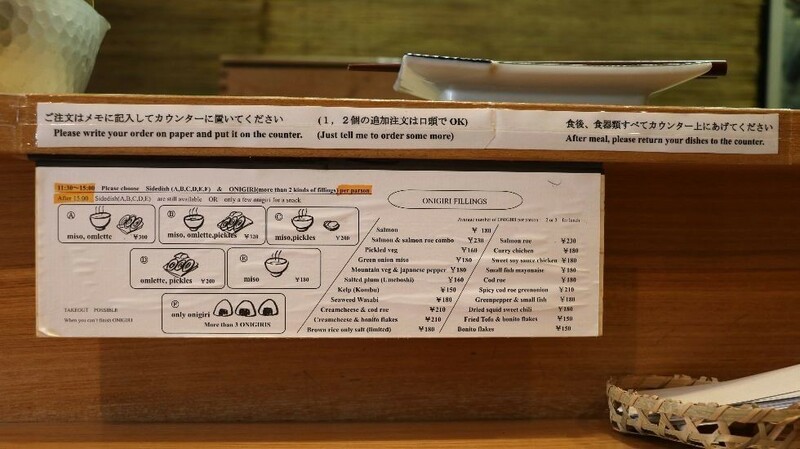 Check either the Japanese or English menu and decide which onigiri you want. 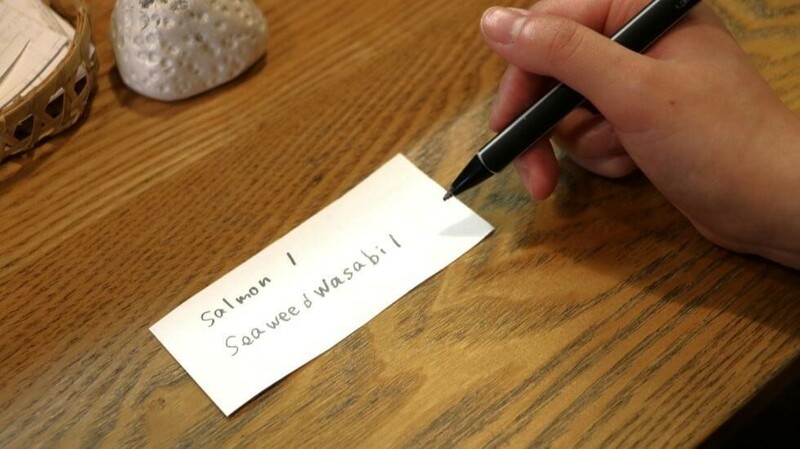 Then write the name of the onigiri, how many you want and place the paper on top of the counter. 3. After you’ve ordered and finished eating, please place your bowls and plates on top of the counter. *If you’re eating in, it’s required that you order two or more onigiri per person. *If you want to order another 1 or 2 onigiri, then not need to write it down, just let the owner know. 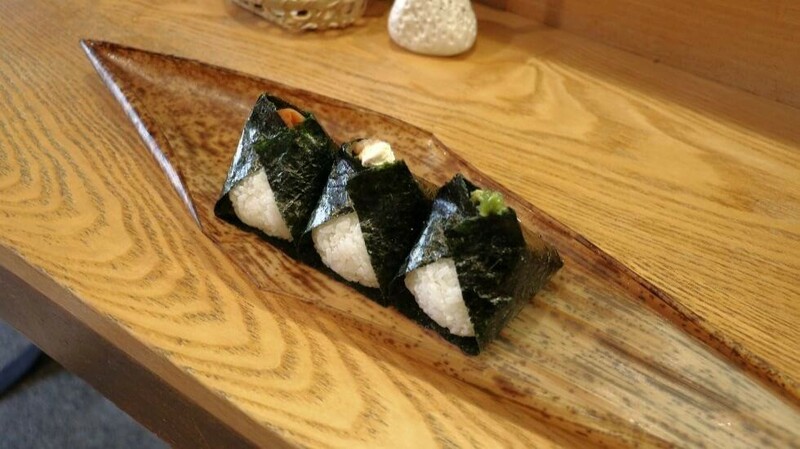 When you order more than three onigiri to go, they will come wrapped in a sheet of bamboo. Not only does the bamboo have a great smell, it’s also naturally antibacterial, so your onigiri will be kept nice and clean. I’m a Japanese person through and through, so I’ve eaten literally countless onigiri throughout my life, but there’s something fundamentally different about ao・onigiri’s rice balls compared to normal ones. There’s no need to say that the taste and setting are of course incredible, but it’s not only that. Each and every onigiri carries with it the energy, thoughts, and feelings of the owner. And no joke, these onigiri honestly do make you feel more invigorated, even after just one bite. I personally am so grateful to have run into such a fantastic place. At ao・onigiri you can experience something you can’t at regular places, very highly recommended. At its core, onigiri is a simple food that requires little work with little ingredients. However, it’s precisely those reasons that make onigiri something that is so directly effected by the thoughts and feelings of the person who makes it. In Aomatsu’s onigiri, you can feel his devotion to bringing cheer to and reinvigorating people’s lives through the onigiri. This isn’t something you can see, so it’s a little hard to explain, but when you try one of these onigiri, I think you’ll understand. ao・onigiri’s heart-warming onigiri are, more than anything, simply delicious. When you eat them you feel a sort of calm wash over you before a bolt of energy hits you. I don’t think I felt that way only because I’m Japanese, I think that foreigners in Kyoto will be able to feel the same way too. I really hope you too will try one of ao・onigiri’s rice balls and feel the warmth of the handmade onigiri, which have a quality just not found in convenience store onigiri. Monday and some Tuesdays Please check Google maps for information on Tuesday closed days. Groups of 5 or more cannot be accommodated. (Take-outs are available) You may have to wait outside the store at lunchtime if it’s busy (Especially 11:00 to 14:00). If you aren’t a fan of waiting, it’s best to place an order over the phone a day in advance and pick it up at the store. There is an English menu available and the owner can speak English, so no need to worry about any kind of language barrier!